Brand New, Never used or Installed, Round, Billet Aluminum with REAL CARBON FIBER inlay ring shifter knob. COMPLETELY THREADED screw-on installation system that will Fit Most Honda & Acura Vehicles with a Manual Transmission. There is NO need for drilling or tapping. All Shift Knobs come with their own locking nut to insure perfect alignment. The locking nut is threaded first into the shifter. The Shift knob is then threaded into the shifter. If the shift knob is not aligned properly after fully threaded, the locking nut is raised up until the numbers align at the desired position and then tightened against each other.\n\nThe Shift Knob is manufactured from one solid piece of Aircraft-Quality, T-6061 Billet Aluminum that is Precision-Machined to produce a firm, reliable feel against your palm for positive shifting. The shift knob features a REAL, HAND-LAID CARBON FIBER RING INLAY around the circumference of the shifter ball. 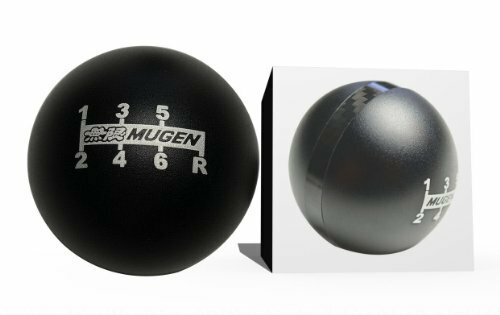 Additionally, the shift knob is Hard-Anodized to ensure a long lasting finish that will provide years of trouble-free reliability. This shift knob is manufactured to Work on Manual Transmission Vehicles ONLY.